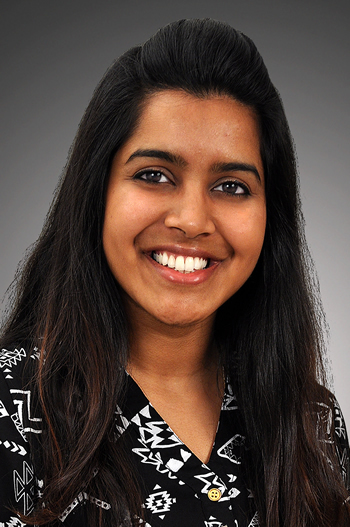 Maloree Khan, a senior biochemistry major and undergraduate researcher in the MU College of Veterinary Medicine Biomedical Sciences Department, was awarded a summer research fellowship from the American Physiological Society (APS). Khan, a dean’s list student from St. Louis, received an APS STRIDE Fellowship. The STRIDE program — Short-Term Research Education Program to Increase Diversity in Health-Related Research — is designed to help undergraduate students nationwide from underrepresented racial and ethnic groups, disadvantaged backgrounds, and individuals with disabilities to work with APS member researchers in the fields of cardiovascular, pulmonary, hematologic, and sleep disorders research. Applicants must be full-time undergraduate students and have an overall GPA greater than 3.0. Khan has a research interest in whether the chronic elevations of a particular hormone produces worse outcomes in patients by limiting the ability of certain receptors in blood vessels to regulate blood flow to the heart. STRIDE Fellows complete 10 weeks of a summer research experience and professional development activities on their campus, plus interactive, online activities with fellows nationwide, exploring career options, responsible conduct of research, structuring research studies, developing abstracts, and presenting research posters. Khan was also offered an MU summer fellowship, but students are not allowed to have both. The APS fellowship offered benefits to both Khan and Bender. All APS STRIDE Fellows receive two-year complimentary undergraduate student membership in the APS and a travel award to the annual Experimental Biology meeting, a multi-society interdisciplinary, biomedical, and scientific meeting that features plenary and award lectures, symposia, oral and poster sessions, a placement center, and an exhibit of scientific equipment, supplies, and publications. The 2018 meeting will be held April 21-25 in San Diego. When she is not at school or in the lab, Khan enjoys running, listening to music, cooking, and hiking.